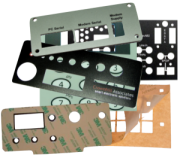 Graphic overlays for electronic enclosures are available on fast turn-around for prototyping and low volume production. Our graphic overlays will put the finishing touch to your design by providing a clean, professional appearance with digitally printed high durability custom graphics. When producing the graphic overlay we do not charge by the hole or cut-out, you can have as many as needed for your panel. Any colour any design. Our graphic overlays are processed within an all-digital print system. A little innovation and state of the art methods have allowed us to develop a system that is fast and cost effective. Our experienced graphics designers may adjust your file to make sure that it prints properly, looks great and matches your case design. If you are not sure about your design or you are happy for us to design your graphics, we can work with you. From a general idea of what you need and we can produce a design for you to approve. We provide high quality graphic overlays and custom labels made to your specifications. With no extra charge for full colour prints or cut outs. Turnaround within a day or two means our service is perfect for prototyping and full scale production. Please contact us for pricing. Pricing varies depending on the size of the item. We do not charge for cut outs or colours. We do not offer Pantone colour matching but we can offer a huge range of printed colours to suit your needs. We can provide design services if you require. Our logo design service compliments our Graphic overlay production. Does your product require a custom designed Logo? In addition to producing Graphic Overlays for your product we can design a customised Logo to help establish your product in the marketplace. Enhance your prototype with a professional Logo.